Well I was away from the blog for quite a bit longer than I expected! Things just kept stacking up...the holidays, I lost my camera (found it, finally), and some family drama followed by a rousing bout of the flu. If your roast isn't already tied, use some butcher twine and tie that sucker up (here are some instructions). This promotes even browning and even roasting. Preheat the oven to 250 Fahrenheit. Heat your fat in an oven safe Dutch oven over medium high heat. Salt and pepper your roast and sear it in the Dutch oven, about 2 minutes a side. Once seared, insert the meat thermometer into the thickest part of the meat and put the Dutch oven, uncovered, into the oven. Once the meat reaches 110 degrees, crank the heat to 500. At this point, you're looking for your meat to be 120 degrees for rare or 125 for medium rare. Once it reaches the magic temperature, whisk it out of the oven and put it on a board to cool. Cover it with a foil tent and let it rest for 20 minutes. Remove the butcher's twine. Cut the roast into thin slices (I use an electric knife, but a sharp serrated one will do). You can eat it right away or pack it up to eat throughout the week for quick breakfasts and lunches. I like to eat mine with little hot pickled peppers. Mayo is good too, but it's really hard to find/make mayo with acceptable ingredients. 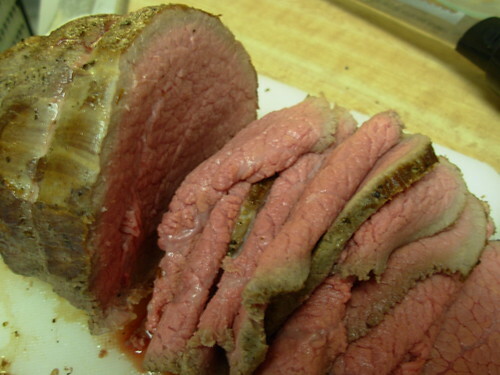 The technique for this roast was found in "The Best Meat Recipes" from the editors of Cook's Illustrated (the America's Test Kitchen people). Hi - just found your blog the other day and I'm looking forward to trying some of your recipes. Made my own paleo meatloaf last nite for dinner with spaghetti squash, but always looking for new ideas. Hi Elizabeth! I was wondering where you were, I miss your wonderful recipes and appealing photographs. Welcome back! Looks beautiful! I eat a Traditional Foods diet, but I can see how many TFers would end up as Paleos just because of the amount of work involved in making grains and dairy digestible. Most people can't sprout grains or ferment raw dairy, so the Paleo diet is a much more realistic option for them. Anyhow, I love your recipes! Keep sharing. Robin - Thanks so much! Shamana - I would never have thought to make bacon grease mayo!! How does it taste? I've tried making my own mayo with extra virgin olive oil (the only liquid vegetable oil I use in my kitchen) and it was really unappetizing. The only way I've found to make it at home and have is taste good is to use light olive oil, but that stuff goes through just as much processing as other veggie oils do so I'm not a fan of eating it all the time. And forget about the stuff you find at the store. Good to see you're back! The roast looks wonderful. I put a dutch oven on my Christmas list but didn't get one, unfortunately. I may have to just buy one. Since it is winter I have been very into roasts. It's an easy way to have leftovers to take to work. Glad you're back to blogging. I don't see an email on your site, I've got a question for you if you have a second. TrailGrrl - Thanks! Dutch ovens are really great. I use mine all the time, especially when I am cooking something that moves from the stovetop to the oven or vice versa. Andrew - I emailed you using the form at your site. Hope to hear from you! Wow.. My mouth is watering. That looks delicious! It must not be working properly. At least I know now!! Thank you. Andrew, I emailed you just now. Let me know if it got through. Just found your blog, Elizabeth. Great work, and can't wait to try some of your makings. Anyway, I've been having marvelous results with what I call "low & slow," even with steaks. It's so great to be able to have it medium rare (or rare) top to bottom and wall to wall. Interesting idea on the second link to use blueberries in the sauce! I might have to try that sometime. I must say, I would be remiss not to mention that I am very surprised about your Roast Beef recipe in that ~salt~ is being used!!!! Caveman...we are not preserving the hunk of meat for a later date as in the "good ole days"
Absolutely delicious. I will use this recipe again. Thanks so much!